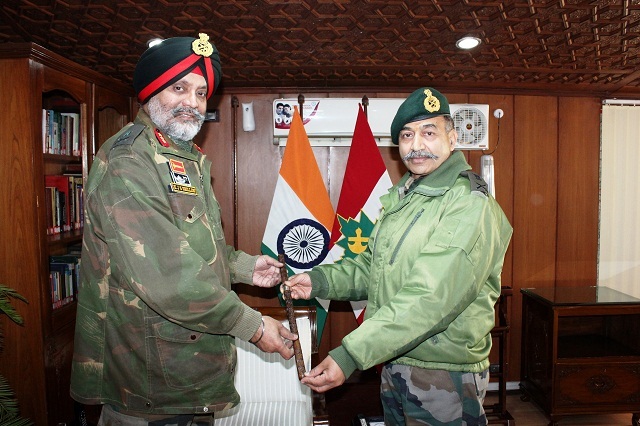 Srinagar, February 09 (Scoop News)- Lt Gen Kanwal Jeet Singh Dhillon took over as the 48th Corps Commander of the Srinagar based 15 Corps, also called the Chinar Corps, today from Lt Gen AK Bhatt. A befitting farewell was given to Lt Gen Bhatt who has moved to New Delhi as Military Secretary (MS) at Army Headquarters. Lt Gen Bhatt’s tenure saw many successful operations neutralising the highest number of terrorists in a year over a decade, wherein 259 terrorists were eliminated and other 64 local terrorists were neutralised through apprehensions and surrenders. This achievement assumes a greater significance in view of imposition of Non-Initiation of Combat Operations during holy month of Ramzan, prolonged period of Amarnath Yatra for sixty days and peaceful conduct of Local Urban Bodies and Panchayat elections. Along the Line of Control, the strategy of swift and robust punitive response to Pakistan’s ceasefire violations and other provocations proved to be effective.